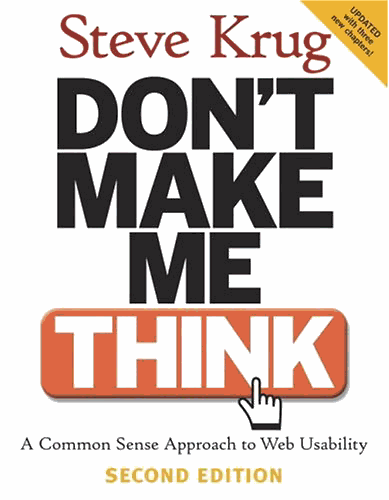 This book is not a how-to-book but rather a book about what’s wrong with how we look at software/web development. It’s suitable not only for designers and developers but everyone that’s involved in the development process. Everybody from project owners and project leaders to interaction designers and programmers. It was a real eye-opener for me back when I first read it and made me reconsider my whole attitude towards the industry and the processes that drives it. This book was what really started my passion about creating good user experiences. I wish more people would read this book as it gives a whole new perspective on the business of creating software. I think it would enable people in different roles to communicate more effectively and have a better understanding of each others work and priorities. I really love this book. It’s written in a fun and engaging way and is also pretty short, making it shock full of valuable tips and insights. Steve Krug has a really pragmatic attitude towards interaction design and usability, making his points understandable for everyone. Or as he himself puts it: “It’s not Rocket Surgery”. If you’re looking for a good introduction to usability and usability testing. I can’t think of a better book than this. Donald Norman is a true giant in the field of usability. 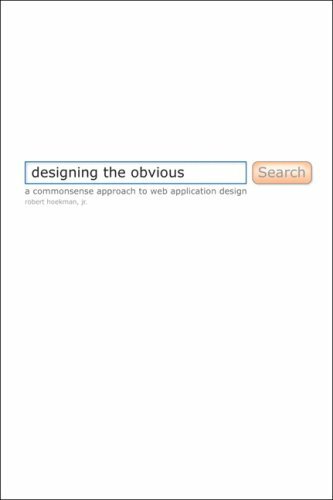 This book is a classic and an essential read for anyone working with user interface design. 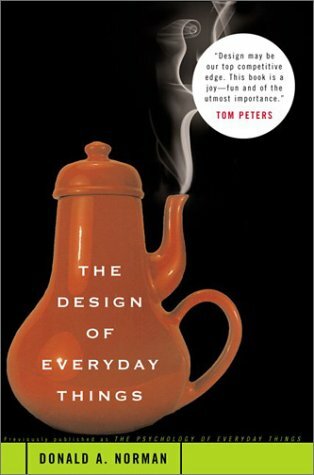 The Design of Everyday Things is not so much a book about software design, but a book about how people perceives the world and interacts with it. He talks about everyday objects like doors and water taps and what makes them easy or hard to use. It’s a lot about how the human brain works and how we interpret different objects according to how they look and feel. 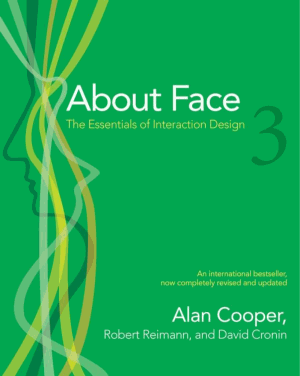 About Face 3 with the subtitle The Essentials of Interaction Design is sort of the sequel to The Inmates are Running the Asylum. Where the latter book have more of a business perspective on usability this book is about how to actually put those ideas into action. Alan Cooper is a strong advocate for User Centered Design (UCD) and was the one coming up with the concept of personas. 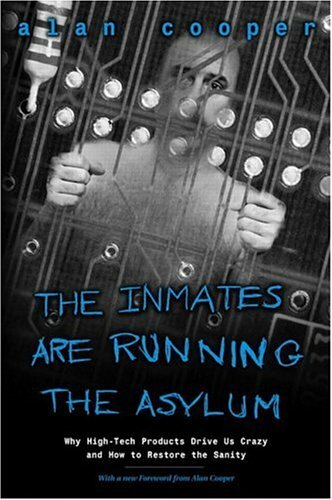 Which, as a side note, was first introduced in The Inmates are Running the Asylum. I think that the first part of the book is the most valuable one. It provides you with the tools to perform effective user research, and how to analyze the gathered data. It also provides fundamental insights into what kind of different users there are and what different needs they have. The two other parts is more of best practices when it comes to the actual design of interactions. One thing that’s really useful is the lists of “Design Principles” that is compiled in a single list at the end of the book. In Designing the Obvious he doesn’t talk about ABCD but he does present seven principles of interaction design that has proved useful in his own work. This book is really nice in its pragmatic approach and will provide you with tons of good advice and a lot of good examples of great design. I liked it so much that I’ve read it twice! Also read the review I wrote on his latest book: Designing the Moment. All of these books have been important for me in my understanding of usability and UX design and I highly recommend all of them. What do you think? Have you read any of these books or other books that you think are essential reading for people working with these things? Nice list of books you have here. I definitely agree with that you put the book of Alan Cooper on number one. I enjoyed it a lot and I think it is for many people an eye opener. Alan Coopers book discusses more interface design in websites while the book of Donald Norman is more ‘product design’ oriented. I think most designers should at least read both! 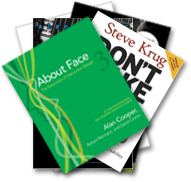 I just started with ‘about face 3’.